I have no idea how I forgot to say this in my last post about Electric Heart. I think I'm losing my mind. The cross was donated to the local chapter of the American Cancer Society. It was auctioned off at their Cattle Baron's Ball last night and the winning bid was $100. Not too shabby. I'm blessed to be able to be a part of wonderful fundraising events. Here it is ~ the mosaic cross that I mentioned in my last entry. As I mentioned, it's quite a departure from my previous crosses. I hesitate to say that though because it's also very true to my style and the direction of my artwork. For instance, it incorporates beads and intricately cut transparent glass like several of my previous mosaic crosses. But it is also more dramatic than most of my other artwork. I have also never made a larger mosaic cross that is predominantly black. I'd love to hear what you think. Please feel free to leave a comment. Ribbons of iridescent glass are interwoven throughout the heart and I carried these "glass ribbons" onto the cross base with beads. I also placed gold leaf in random places on the background. I then pieced the background in transparent glass so the black and gold leaf would be seen. I grouted in black. Just a quick "fly-by" post to share my latest mosaics. I'll include a brief description with each picture. A Dove Cross. This mosaic was given by my client to a special friend for her birthday. The blue/green transparent and textured background really makes the iridescent white dove "pop." This is the first time I've used the background glass and I am so happy with the result. It's such a calm, peaceful color. The transparency and texture give it a water-like feel. It's very soothing. The cross is on my Small (7.5" x 10") cross base. An interesting tidbit ~ the dove is my most requested cross design. I'll write more about the symbolism and significance of the dove in the future. Pink Handpainted Daisy Heart Cross. A First Communion gift. The background is light, pastel pink. I have the hardest time photographing it. It's softer in person. Letter "A" with Butterfly. This mosaic will be a baby gift. The colors and butterfly were chosen to match the baby's nursery. My Mosaic Letters are approximately 4" tall. Flared Heart Cross with Brown Border & Iridescent Background. A wedding gift. The cross is made on my Smallest (4" x 6") cross base. Apple Cross. This mosaic was commissioned as a graduation gift for my client's friend. I bet you can't guess what profession the friend is entering?! The order also includes custom designed notecards featuring this cross image. The cross is made on my Smallest (4" x 6") cross base. I have also recently finished 2 larger crosses. I'll share 1 of them in my next entry. It's quite a departure from my "norm." I'm anxious to hear what y'all think! Check back soon. Sorry to go MIA for the last week . . . I'm still trying to recover from surgery (although I'm getting better every day), then my laptop crashed yet again and then my grandmother was admitted to ICU, then Hospice and passed away yesterday morning. As sad as it is for my family, the thought of her living her earthly body behind and rejoicing with her loved ones in Heaven brings a smile to my face. In many ways, I think the days after Easter are more important than the actual day of Easter. Resurrection Day of course is the central focus of Christianity and gives meaning to our faith and beliefs. But what about the days following Easter? When the focus shifts to our actions and how we live out the Resurrection in our daily lives. Is your life any different because Jesus arose from the dead yesterday? What are you doing differently today . . . and tomorrow . . . to ensure that Jesus lives in your life? I'm celebrating this morning because the 500th subscriber was just added to my email newsletter list! It's so amazing that there are 500 people out there who are interested in my artwork. I'm truly blessed. Because I'm an overachiever and "a lot" is never enough, my goal is to reach 600 subscribers by the end of the year. 100 new subscribers is a big undertaking so I need your help. Please tell your friends, family, coworkers and/or anybody else who might be interested in my artwork to visit my site and/or blog and sign up for my email newsletter. I really appreciate your help and support. My clients rock! A quick note to let y'all know I have updated the Cross page and Cross Galleries pages on my website. My hope is that the pages are cleaner, easier to navigate and easier to understand. The pictures have also been recropped and the lighting adjusted so you can see better images of each mosaic cross. I would love to hear your comments on the layout and design of the pages. I still plan to add an individual page for each cross to give you more information, the "story behind the cross" and detail images. I will try to add a few each week so be sure to check the site often. Thanks for checking out the site and I look forward to hearing from you! It just occurred to me that I haven't posted any new art lately. I haven't been creating as much lately because I've been busy with my art marketing classes and recovering from recent surgery. But I thought y'all might enjoy seeing some of my older mosaic crosses and learning their "stories." This series of 3 identical crosses is titled, "From Guatemala With Love." I was asked by my client to create a unique Christmas gift for her children's grandparents. The client has adopted 3 beautiful little girls from Guatemala. She wanted the crosses to reflect the girls' Guatemalan heritage as well as the incredible amount of love the girls have brought into their family. Thus we chose the blue, white and bright yellow color scheme to reflect the colors in the Guatemalan flag. The 3 hearts on each cross symbolize the 3 girls. The ceramic hearts were hand made and painted a bright yellow by one of my wonderful vendors. The client was thrilled with the results and word has it that the grandparents love their unique crosses and their symbolism. 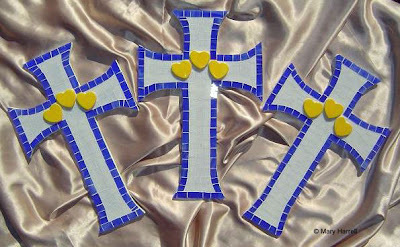 These mosaic crosses were completed Fall 2006. They are on flared, small (7.5" x 10") bases. I hope to have new mosaic artwork to share next week. I've been working on updating the Cross Galleries on my website to make the pictures sharper and the pages cleaner and easier to navigate. It's a lot (that's for you Lori!) of work given that there are over 100 mosaic cross images displayed on my site. But it's also like visiting with old friends in a comfortable, familiar place. Maybe that sounds odd. Let me explain. I often say, "My crosses are my passion." Clearly, I love everything about creating my crosses (and other artwork too!). I love the symbolism of the cross. I love working with God and my client to create the perfect, unique cross for each client. I love choosing the materials. I love placing the beads, cutting the glass, piecing the design. I even love grouting. And finally, I love the awesome feeling of seeing the design come to fruition. But it's more than that. Long after they have been sent to the client, each cross remains in my soul. I fondly recall each client I worked with, the give and take that goes with creating each unique design, the story behind each cross, what was happening in my life at the time, the completed cross . 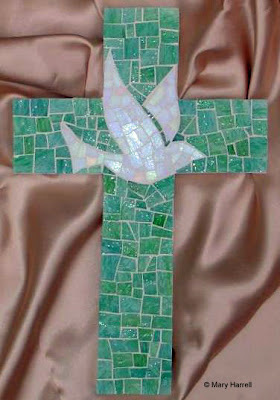 . . there are so many happy memories and associations with each mosaic cross I am blessed to create. My crosses are an amazing, integral part of me. They are my passion. They bring me joy and awe no matter how many times I revisit their pictures. Not in a conceited way . . . but in a way that I know this is what God wants me to do. May your life be filled with the same kind of passion. P.S. The new Cross Galleries on my website should be complete in the next few days. I'll be sure to post and let you know when to check them out! Have you been anxiously checking and rechecking my blog? Are you worried I have disappeared? Is anybody out there? LOL! I have been spending alot of time focusing on my art marketing class and redesigning my website. My current class has been great and I'm really excited not only about all of the great information but about the wonderful artists I've met. I've received a wealth of knowledge and advice and I'm looking forward to putting it all to good use. You'll also start to notice changes (some subtle, others obvious) on my website. I have a very long list of things to change, add, delete, etc. My hope is to create a tighter, cleaner and easier to navigate site. I also hope to provide better pictures of my artwork. If you have any thoughts on things you'd like to see on the site or other recommendations, please leave me a comment. Heck ~ just leave me a comment and let me know you're out there. The cross is a Grandmother gift ~ a special gift honoring the birth of the recipient's granddaughter. It is on my smallest cross base ~ 4" x 6" ~ and the background is pieced with matte iridescent white glass (it doesn't show up as much in the pictures but it's beautiful!). The flowered cross in the middle was created by a fellow artist Jean West. She specializes in fused glass and incorporates her creations into beautiful jewelry. I was fortunate to meet Jean last Fall at a show in Houston and I spent a few hours in her studio a few weeks ago. Talk about inspiration! She's an amazing person and her artwork is fabulous. You can check out her site at www.jwestbeads.com You will definitely be seeing more of her pieces appearing in my artwork. A few new mosaics to share. Enjoy! That's it . . . hope your week started off happy! Showing love . . . the mosaic way! So . . . are you wondering how these mosaics "show love the mosaic way." Well ~ let me share their "stories." Last summer ~ I received a phone call from a client and she told me about a broken Pyrex kitchen bowl she had. She explained that the bowl was very special to her and her husband as it has been in the family for several generations. They were both sick that it had broken and wanted to know if there was anything I could do with it. The cross is the result. As difficult as the Pyrex was to cut and control, my client is thrilled with the cross. It will show their family love for years to come. The mosaic picture frame was commissioned as a Baptism gift. I love the idea of the personalized heart . . . a great way to show love for a beautiful new baby and her family. My artwork is the perfect way to show your love . . . not only at Valentine's Day . . . but year round. Need a wedding, baby or house warming gift? Does your sister or dear friend have a birthday coming up? Are you looking for the perfect gift for a teacher or Sunday School leader? My mosaics are perfect . . . and the really great thing is that they can be customized to suit your needs and/or desires. Who are you going to show your love to? Happy Valentine's Day. I hope that today finds you with a joyful and happy heart! The Angels are here to stay!